Also, wildlife played an important role in presettlement times in maintaining the integrity of oak savannas. Together with fire, wildlife aided in cleaning understory brush, thus helping to create the sparsely wooded character of the savanna. Restoring oak savanna should be an important wildlife management objective and has been so recognized by the U.S.D.A. (NRCS) Wildlife Habitat Incentives Program. Acorns are the most important wildlife food in Midwest deciduous forests, “the ecological equivalent of manna from heaven”. “There are many advantages to oak ecosystems (timber, recreation, and aesthetics), but we share the belief of many wildlife biologists that the true value of oak forests rests in their contribution to wildlife.”. Of the various species of forest trees, oaks are by far the most important providers of animal food. The open character of the savanna and the much greater diversity of forbs and grasses makes this vegetation type an ideal support system for a large variety of wildlife. Trees are used by wildlife in several ways. Den trees are living trees that contain holes large enough to provide shelter for wildlife. Mast trees are those which produce fruit (acorns) usable by wildlife as food. Snags are dead trees large enough to be used as feeding, perching, or nesting sites by animals. Despite often stated concerns, fire rarely harms wildlife. Instead it is beneficial, generally essential, for successful populations. The biggest effects of fire on wildlife are indirect, promoting good food and cover, successful nesting and brooding cover, browse and forage quality, seed production, and increased invertebrate availability (as food sources). The direct (harmful) effects of fire on wildlife are minimal. Large mammals run, small mammals hide, birds fly, and herps hide. Birds whose nests are disturbed by fire readily re-nest. However, intense fire may cause some wildlife damage, so that conditions for prescribed fire should be set so that the fire runs "cool". Frequent fire, at 1-3 year intervals, is desirable, since it tends to run cooler and reduces woody cover (which in generally is detrimental to wildlife). Infrequent fire (3-5 year intervals or longer) tends to be hotter (since there is more fuel buildup) and in addition results in heavy growth of undesirable brush. Not burning at all is the worst. The term “mast” refers to the fruit of the oak, beech, and other forest trees that produce seeds of sufficient bulk and nutritional value that they can serve as a food for larger animals. Acorn production varies widely from year to year, and oaks exhibit years of good acorn production (“mast years”) and years of poor acorn production (“nonmast years”). An interesting aspect of masting is that it is a population phenomenon. In general all the oaks in a stand exhibit high or low acorn production the same year. Animals that make considerable use of mast exhibit population fluctuations that track the annual changes in mast production. The masting phenomenon is characteristic of trees with large-sized seeds, and is thought by ecologists to have evolved as a means of ensuring sufficient seeds for the reproduction of the tree species. In high mast years, when large numbers of seeds are produced, there are insufficient animal seed eaters to consume them all, thus leading to successful establishment of new tree seedlings in these high-mast years. Because there are more low-mast than high-mast years, populations of acorn eaters are controlled by the low mast condition. In one study of various species of oaks, each species of oak had its own good mast years, which were different from those of other species. Over a five year period, there were three poor mast years, one moderate mast year, and one very good mast year. The cycle of masting will vary not only with the species, but with the location and various environmental variables. High seed production provides an enormous input of food for seed consumers in forests. High-mast years lead to abundance of body fat in mammals, thus aiding in their survival during harsh winter conditions. Because rodents are short-lived creatures, their populations tend to fluctuate with quantities of mast. On the other hand, deer, which are longer lived, benefit from the high mast situation but do not exhibit sharp population fluctuations that small mammals do. Despite extensive research on masting in oaks, there is no single explanation for the annual variability. Weather is an important factor, but how does it influence masting? Possible environmental factors include late freezes that might kill oak flowers, variations in the efficiency of pollination, the initial size of the female flower crop, and conditions that might affect flower survival. Larger trees produce more acorns than smaller ones, although not all large oaks are good acorn producers. In Minnesota, bur oaks seem to be on a two-year cycle, whereas white oak and northern red oak are on a three year cycle. Occasionally, the cycles come together and all oak species show high masting in the same year, which leads to an extraordinary acorn production. The year 2000 was such a year in the Midwest. Animals whose reproduction cycles depend on mast include squirrels, bears, and deer. Oak mast is also heavily used by wild turkeys, ruffed grouse, bobwhite quail, raccoons, and small rodents. Acorns can also be a major food source for humans. Native Americans in the foothills of California used acorns as one of their most important food sources. Acorns are an ideal food source because they can be stored for long periods of time, and can be readily processed into a tasty flat bread. According to the Wisconsin Department of Natural Resources, oak savanna was historically the optimum habitat for deer, as well as for other game species such as bobwhite quail, turkey, squirrels, and rabbits. Thus, management for oak savanna is definitely compatible with wildlife management and hunter issues. Mast is an important factor in deer maintenance, especially in habitats where deer food is restricted. Mast is most important during fall but is also heavily used during spring and summer. Oaks in savannas are great acorn producers, since their branches are exposed to maximum amounts of light. Also, competition for nutrients is minimal in savanna oaks. Thus, from the food standpoint, the savanna habitat is ideal for production of healthy deer. However, if the deer population is excessive, overbrowsing of oak grubs and saplings has the potential to cause long-term reduction in oaks. Deer compete with a variety of animals for acorns, including squirrels, chipmunks, woodrats, mice, ducks, woodpeckers, bluejays, and wild turkeys. Deer show a distinct preference for acorns from the white oak group (white, bur, swamp white) over the red oak group (red, black, northern pin). The wild turkey (Meleagris gallopavo), a native species of the New World, is the largest game bird in North America. It had almost been eradicated in much of the Midwest but has made a remarkable recovery in the past several decades. One important reason for turkey success has been intensive habitat improvement, supported to a great extent by private landowners. Although turkeys are adaptable animals, they prefer oak forests, especially those that are interspersed with openings. Thus, the oak savanna habitat is ideal. Turkeys are not migratory birds, but range fairly widely. In southern Michigan, for instance, the home range of the turkey was estimated to be 1-4 square miles (around 1000 to 2000 acres). Turkeys need habitats with good opportunities for roosting and nesting as well as dependable food sources. The preferred roosting habitat is a large tree with horizontal limbs, such as an open-grown (savanna) oak. For nesting, turkeys need moderately dense understory vegetation that helps conceal the nest but at the same time allows the hen to survey her surroundings. Wild turkeys are omnivorous and opportunistic feeders, but acorns are considered an important food item. In high-mast years acorns may be the primary food of turkeys during fall, winter, and spring. During these periods of the year, as much as 30% of the bird’s diet is acorns. Acorns are eaten by turkeys in preference to all other foods. Turkeys avoid foraging in habitats with dense, woody understories; thus the oak savanna habitat is ideal. The ruffed grouse (Bonasa umbellus) is another bird that prefers open woods. According to the Ruffed Grouse Society, they thrive best in forests that are kept open by frequent clearing or fire. Grouse and turkey often nest in similar habitats. It is not unusual to find a ruffed grouse and turkey nests near each other in the oak savanna. A number of desirable bird species nest in tree cavities. Many species of cavity-nesting birds have declined in the United States because of habitat reduction. Cavity-nesting birds may either excavate their own holes, use cavities resulting from decay, or use holes created by other species. The trees used by cavity-nesters are dead or deteriorating specimens, commonly called “snags”. Unfortunately, snags are often considered undesirable by forest and recreation managers, and they are often eliminated from the forest. For oak savanna management snags should be left unless they are in danger of falling over roads or public trails. The following is a list of cavity-nesting birds common in the Midwest. The majority of cavity-nesting birds eat insects. Because these birds are a major part of the forest-dwelling bird population, they play an important role in the control of forest insect pests. This photo shows an ideal habitat for cavity-nesting birds.. Similar connection to oak savannas probably occurs in Illinois and other Midwestern states. Abundance of selected savanna bird species in Wisconsin. Abundance given for the southern and western portions of Wisconsin, where savannas occur. C = common; FC = fairly common; U = uncommon; R = rare; CL = casual, local. Legal status in Wisconsin: T = threatened; E = endangered; SC = special concern. Open grassland = grassland with little or no shrub or tree cover. Open with shrubs = grassland with scattered shrubs or shrub clumps (1 dm-tall); less than 30% total shurb cover. 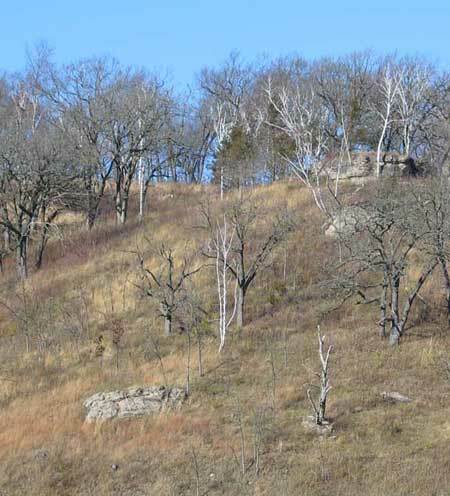 Scattered trees = grassland with scattered open-grown trees, 0-50% tree cover. Semi-closed canopy = Areas with tree canopy cover greater than 50% but less than 75%. Birds in this group tend to increase with increasing canopy cover. Shrub understory = Habitats with a shrub layer beneath a tree canopy layer. One cavity-nester, the red-headed woodpecker, is a species of special interest because it has declined drastically over the past decades. 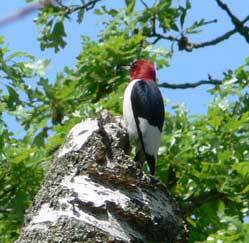 Red-headed woodpeckers thrive in areas that provide open areas for foraging, and well-spaced trees for nesting. The oak savanna is ideal for this species., and throughout their range savanna restoration may lead to re-establishment by these birds. Breeding bird observations have shown that there has been a sharp drop in red-headed woodpecker numbers throughout much of its range. Decline has been linked to habitat loss, changing land use, changes in vegetation due to succession and fire suppression, and competition with other cavity-nesting species. Red-headed woodpeckers nest in trees but throughout the breeding season obtain much of their food from insects on the fly. They inhabit oak savannas and open woodlands and flycatch over open fields and adjacent roads. In the absence of open oak areas, they forage over roads. They perch on telephone poles or roadside trees and swoop down across the open space and catch insects. One reason for decline is mortality due to impact with motor vehicles, especially high-sided trucks. Anecdotal evidence from one Wisconsin oak savanna restoration indicated that opening up the savanna by removing invasive trees and shrubs resulted almost immediately in settlement of the area by red-headed woodpeckers. Red-headed woodpecker (Melanerpes erythrocephalus) in an open oak savanna area. Research on plant/insect specificities has been mostly confined to prairie plants, but it seems likely that there are many insects that are specific for savanna plants. However, the only detailed knowledge available is for the Federally Endangered Karner Blue Butterfly, which lives specifically on lupine (Lupinus perennis). Lupine thrives in partially shaded to open areas with nutrient poor, generally sandy, soils. Black oak savannas (Quercus velutina) are often the dominant savanna vegetation in such sites, and the Karner Blue has a marked specificity for these savannas. Another "hot bed" of Karner Blue restoration is the Central Sands area of Wisconsin. The Necedah National Wildlife Refuge is a large, publically accessible area in the Central Sands that is being managed (among other things) for Karner Blue restoration. Koenig, Walter D. and Johannes M.H. Knops. 2002. The Behavior Ecology of Masting in Oaks. pp. 129-148 In McShea, William J. and Healy, William M (editors). Oak Forest Ecosystems: Ecology and Management for Wildlife. Johns Hopkins University Press, Baltimore. Wild Turkey (Meleagrus gallopavo). Wildlife Habitat Management Institute, November 1999, Fish and Wildlife Habitat Management Leaflet Number 12. Managing Your Land for Wild Turkeys. Wisconsin Department of Natural Resources, July 1998.